After 10 years of struggle the Serie A side had just one step to make and it proved really easy. As officials announced yesterday, redevelopment of Stadio Friuli is to begin on May 13. It's been a decade of bureaucracy for Udinese, who aim at redeveloping their spacious Stadio Friuli into a more compact arena. The stadium is too big for club's needs and strongly outdated. 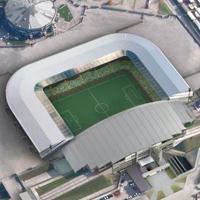 Thus the plan to downscale it to 29,000, scrap the running track and make it robust, like it happened with Juventus. In Udinese's case the main stand will remain in place, while three other sides are to be reconstructed. Last step after having acquired 99-year lease and permission from the city was approval of CONI, the Italian Olympic Committee. This decision came very promptly, raising enthusiasm with the club, clearly expressed during yesterday's press conference. Udinese didn't only meet with journalists to say they have all the paperwork done, they informed about ground-breaking being set at May 13. Construction will start just hours after Udinese takes Atalanta and should last until September 2014, early enough to play the 2014/15 season at the revamped ground. The price of Udinese's project is set at some €25 million.